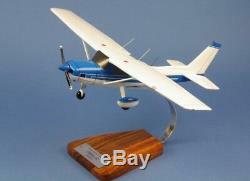 PS Models 1/22 Scale Cessna 150 152 Aerobat Blue & White Private Solid Wood Desk Top Display Model Airplane With Wood & Metal Stand Item #VF062. Painstakingly built from mahogany wood by skilled craftsmen with a wealth of detail, hand-carved & hand-painted, with great concern for exact accuracy makes a great gift for any pilot, aviation buff or history fan. The model measures approximately 13.13" long x 18.18" wingspan. The item "Cessna 150 152 Aerobat Desk Top Display Private Model 1/22 Aircraft AV Airplane" is in sale since Monday, January 21, 2019. This item is in the category "Collectibles\Transportation\Aviation\Private Aircraft". The seller is "bordi20" and is located in Stadskanaal. This item can be shipped worldwide.